1.) The Objective of the game is to uncover and attack your opponent’s Crown Card with one of your own cards. 2.) Each player places 5 piles of 5 cards face down in front of them. You can arrange the cards however you like and should place the crown card on the bottom of one of the piles. 3.) Players take turns attacking by selecting the top card from one of their piles and laying that card face up in front of one of their opponent’s piles. The card with the lowest value (1-6) loses and is discarded. 4.) A player wins the game by uncovering the other player’s crown card. There are several other special cards to spice up the game. 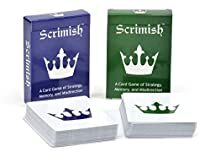 See official rules at www.Scrimish.comBATTLE ON!